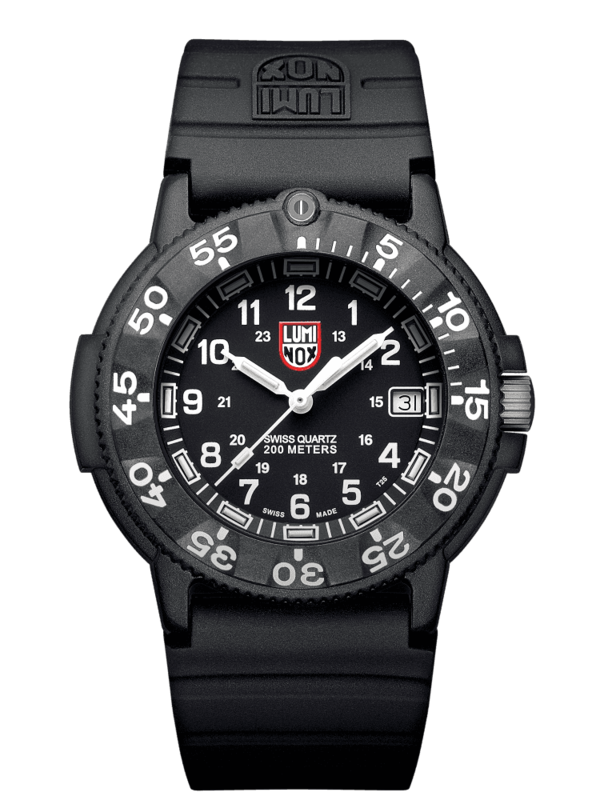 Luminox is a reputable watch brand notable for its “always visible technology.” The watch hands and markers of Luminox models contain tritium inserts for long-term luminescence. 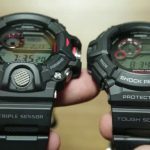 The brand is also known for manufacturing military-grade, custom watches for groups like the US Air Force, U.S. Bobsled Team, U.S. Navy SEALs, and U.S. Coast Guard, among others. If you’re in search of a day-to-day watch that combines head-turning design with maximum functionality, the Luminox Evo Navy Seal Blackout Men’s Watch should be one of your top choices. Luminox has four lines of water-resistant watches: “Air,” “Land,” “Sea” and “Space.” The Evo is part of the Sea collection. This Luminox Navy Seal watch was designed with an all-black theme, but the “blackout” term is used to describe its visibility prowess in low-light environments. At daytime, the watch is user-friendly thanks to the embossed numerals and white-colored date display positioned near the 3 o’clock. 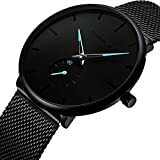 Case – The all-black, 44mm-diameter, 12mm-thick case is made of carbon reinforced polymer for extra strength while keeping the watch relatively lightweight. 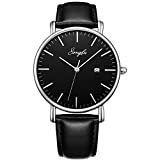 Bezel and Dial Window – The watch’s bezel is made from black, unidirectional-ratcheting, carbon-reinforced polymer, while the dial window was constructed with hardened mineral crystal that provides shatter-resistant, shock-absorbing, and scratch-resistant properties. Hands and Dials – This gorgeous timepiece is designed with a black luminous Arabic numeral hour markers that blends in with black second, minute and hour hands. Yes, that’s black on black, but it’s actually easy to ready since the markers and hands were designed with tritium gas tubes (a long-lasting and reliable gaseous light source). 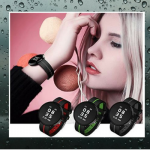 Strap – It is built with double-locking buckle and a silicon-type 23mm wide rubber band that works well wet or dry. It isn’t the most durable choice of material for the strap, but it definitely matches the theme of the Evo. 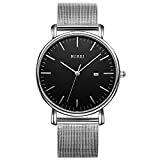 Genuine Swiss Quartz movement – This super-sleek watch is equipped with Swiss Quartz movement known for accurate timekeeping and long-lasting battery life. One of the key features of the Luminox Navy Seal watch is the Tritium illumination, which is supposed to light up continuously for up to 25 years without the need for battery or solar power. A few users complain that the tritium tubes are too thin to become effective, but this may just be a case of faulty units. Low magnetic signature – This feature is rarely found on watches like these, which is why it’s an added benefit if the wearer’s work involves a compass, magnet, explosives, or regular checkpoints at airport security. 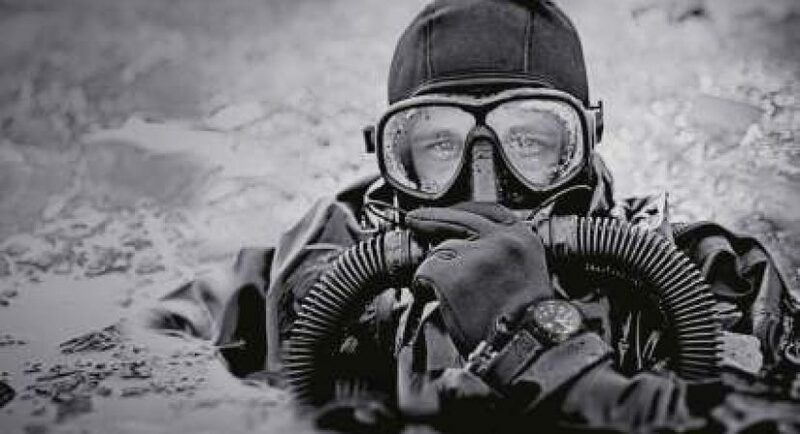 Water resistance – Because the Luminox Evo Navy Seal Blackout Men’s Watch is part of the ‘Sea’ collection, you’d expect that it can resist a good level of water. It is rated to withstand water pressure even up to 200m or 600-feet deep (that’s 20 bar for serious diving, or other marine activities). There are many things to like about the Luminox Evo Navy Seal Blackout Men’s Watch, and a few, but serious issues about the watch that you should consider. Doesn’t have a screw-down crown (if you prefer this for diving and other water activities). The Evo uses a double-security gasket instead. No backlight that can be turned on or off (this shouldn’t be a problem since the Luminox Evo Navy Seal Blackout Men’s Watch has tritium inserts that make hour markers and hands glow super-bright even in complete darkness). Probably the most worrisome downside to buying this watch is that Luminox (in general) is a favorite brand among counterfeiters, which means you have to be extra careful when choosing a store. 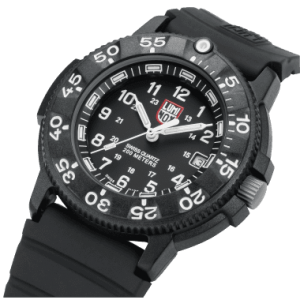 Some experts say that fake Luminox watches are shinier than its original version, and mostly have different font used on the dial’s numbers. 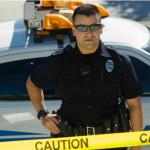 Luminox is a brand you can count on when it comes to high-functional and sleek-looking watches, and the Luminox Evo Navy Seal Blackout Men’s Watch is no exception. The pictures don’t do justice as to how handsome-looking Evo’s all-black design actually is. And since its design has neutral colors, it can be worn in any occasion, whether you’re working hard underwater, or at the office pushing paper, attending formal events, or going rugged for a hiking trip… it’s very versatile. 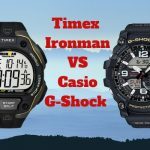 The Luminox Evo have hit or miss reviews with the negative reviews mostly due to the bands/strap issues, or void warranty claims because they bought from unauthorized retailers. 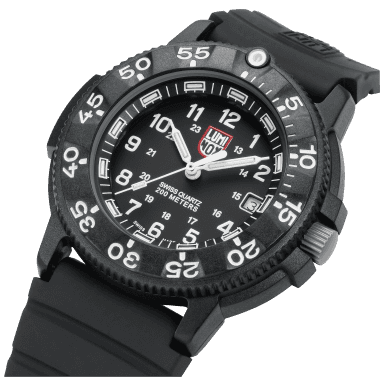 Note that Luminox is a highly counterfeited watch brand, which is why it is best to go with a reputable seller when buying branded watches. Overall, this Luminox Navy Seal Watch can outperform many watches in its price range. It’s durable, lightweight, scratch- and water-resistant, and exceptionally head-turning. It’s designed well enough to be worn even on extreme water activities, and boasts of an always-accurate Swiss Quartz movement. If you want a timepiece that’s comfortable to wear, provides accurate timekeeping, and made of high-quality materials, the super stealthy-looking Luminox Evo Navy Seal Blackout Men’s Watch is definitely worth the look.